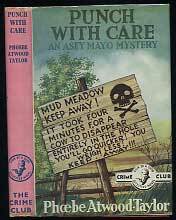 Some information on the dust jacket: For many years it was thought to only exist unpriced. So allowing booksellers to select their own price via adhesive sticker. Of the few copies known to exist, invariably they were unpriced and UK origin. The copy in Cooper & Pike Vol I, for example, shows the mark on spine where the sticker was removed, the fake jacket seller also has an unpriced jacket. 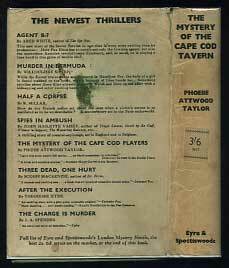 Relatively recently I did hear of a copy with 7/6 printed on the spine, though in all my years collecting, trading and researching crime fiction I've yet to personally see one - every one I've heard of via collectors and dealers has been unpriced. I've known the history of this book, and it's collector owners, for over two decades, right back to when it was originally bought for £1 at an antiques fair ! TAYLOR, Phoebe Atwood. Also wrote as Freeman Dana; Alice Tilton. American. Born in Boston, Massachusetts. 18 May 1909. Educated at Barnard College (Lucille Pulitzer Scholar), New York, B.A. 1930. Married Dr. Grantly Walden Taylor, Full-time writer from 1931. Lived in Westoii. Massachusetts. Died 9 January 1976. 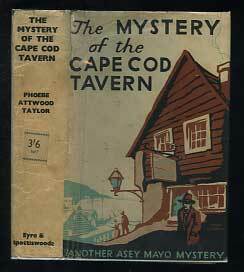 The "Codfish Sherlock," as Asey Mayo is called, has never been far from the sea throughout his life. He made his first voyage on one of the last of the clipper ships. Subsequently, he sailed as steward, cook, or ordinary seaman before retiring to Wellfleet on the Cape Cod peninsula of Massachusetts. He is now man Friday for the town's wealthiest tycoon. Apparently, the job gives him enough time to drive cars at top speeds and to solve many local murders. In appearance, Asey Mayo is not impressive, since he is usually bedecked in old, worn clothing and walks with his tall, lean frame hunched over. His head is thrust forward, and his mouth often contains a wad of chewing tobacco. His appearance is deceptive; he is a detective with a profound knowledge of human nature and a remarkable record of deductive success.